By KatieB, August 3, 2004 in INTRODUCE YOURSELF! Introduce yourself in the Welcome New Members forum. Tell us a bit about yourself and your motivation for joining the community. If you are someone living with cancer, tell us as much as you’re comfortable sharing about your diagnosis and prognosis. Many of the other survivors who are members have been in similar situations. While no two journeys are the same, it can be very helpful to connect with someone who has been on a similar path. And you’ll find that an online support system can be very empowering and uplifting! Need more help to get started? We extend our insight and experience, as those who have walked this path before you, and we extend our support to you during this difficult journey. Here, you will find support, friendship, information and hope from other members who know and have experienced what it is you are going through. We know that this is a scary and uncertain time. We invite you to register as a member (it's free) and introduce yourselves. We come here for support and to support others. The members here understand- when it feels like no one in our "real" world does. We are a family. You ARE a survivor from the moment you are diagnosed. Your caregivers, families and friends who walk this journey with you are co-survivors. 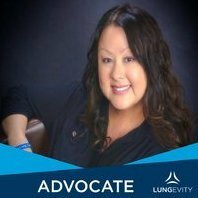 Welcome to LUNGevity's Lung Cancer Support Community online support network. Message me or any of our volunteer moderators if you have any questions or concerns.